MOSCOW HAS APPOINTED actor Steven Seagal as a special envoy, dealing with humanitarian links with the United States, the Russian foreign ministry announced this weekend. “The task is to promote the further development of Russian-American relations in the humanitarian sphere, including interaction in the field of culture, art, public and youth exchanges and more,” it added. 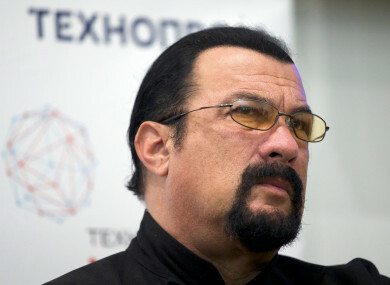 Seagal’s fame peaked in the late 1980s and early 1990s with films such as “Under Siege” and “Above the Law”, but he remains hugely popular in eastern Europe and was granted both Russian and Serbian citizenships in 2016. After Russia’s annexation of Crimea in 2014, Seagal called Putin “one of the great living world leaders” and even performed with his blues band in the annexed Black Sea peninsula. Seagal was seen at the 2018 World Cup in Russia and was also among the guests when Putin was sworn in for a fourth term in May. The 66-year-old actor is also among the Hollywood figures accused of sexual misconduct during the #MeToo campaign. The Russian ministry said he would not be paid for his envoy role. The announcement comes with Russia-US ties at a low ebb, over long-standing conflicts in Syria and Ukraine and allegations of Russian interference in the 2016 US presidential election, which Moscow rejects. Email “Steven Seagal's been appointed a special envoy for Russia”. Feedback on “Steven Seagal's been appointed a special envoy for Russia”.